San Jose police on Monday are expected to provide more details regarding a Friday shooting involving a naked man in San Jose. Kris Sanchez reports. San Jose police on Monday are expected to provide more details regarding Friday's officer-involved shooting that involved a naked man chased children in the South Bay city. The man, who remains in critical condition as of Sunday night, took off his clothes and began chasing youngsters before leading officers on a pursuit. He was eventually shot and arrested at a busy West San Jose shopping plaza, witnesses and authorities said. When police arrived on scene after receiving calls from concerned parents, neighbors said the man jumped in his truck. When the man drove off he hit another truck and evaded police. The pursuit at around 2 p.m. prompted the shutdown of Stevens Creek Boulevard, near a Safeway parking lot at Lawrence Expressway. A tense scene unfolded around the shopping plaza with a swarm of officers descending upon the area. A witness, who did not want to be identified and was driving on Steven's Creek and Lawrence Expressway, said he saw police officers shooting the truck multiple times. The witness said that when he pulled over by the side of the road, a number of police officers were approaching the truck, which was smoking at that point. "I heard them ask the guy inside to come out but he didn't," the witness said. At that point, the witness said, at least three officers fired at least nine shots at the car. Officers eventually dragged the man outside the truck. "He lay still for a bit, and then moved," the witness said. 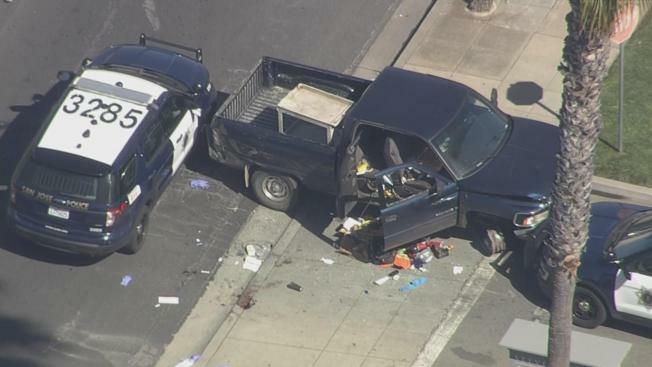 Footage from NBC Bay Area's SkyRanger showed the truck's contents strewn across the road in front of the Safeway. Bullet holes dotted its surface. It was not known late Friday if the man was armed.